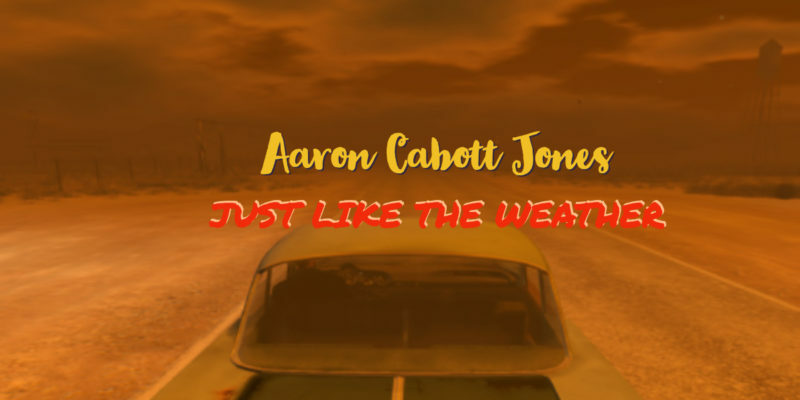 Aaron Cabott Jones recently released his brand new single Just Like The Weather, fusing his sense of story-telling with an authentic Americana vibe in brilliant way. We caught an interview with the musician and songwriter to find out more about his life as an artist to date and his hopes for the future. Here’s how it went. Hi Aaron – thanks for the interview! Loving the new song – what prompted you to write Just Like The Weather? I wanted a song that would be relatively easy to structure around a story from my teen years. And a blues pattern provided that. But I always loved the way the Beatles changed songs up in the bridge, so I worked in the minor chords to give it a bit more drama… at that age everything is drama… I thought that worked particularly well for Just Like The Weather. And since I’ve been releasing a lot of stuff I wrote in the 70’s like I did on Adventures, I realised stories from that time were missing. And one particularly funny chapter centered around my first car (a 1963 Ford Fairlane), “Wood Grain”. We called it that because the guy that sold it to me painted it brown with a house painter’s brush, so it had this wood grain look to it – haha! Of course at that time in your life, the most important thing is a car and a girlfriend. I was sixteen, she turned eighteen shortly after I got the car and left me for this kid that drove his parents car and had a fake ID to get into clubs… Of course as teen logic dictates, that would make sense, right? The rest is fiction, but that’s where the motivation for the song came from. How have things been for you as an artist since you first released The Adventures Of Aaron Cabott Jones? Well, after I went through the excitement of finely getting songs out that have been lying dormant for so long. It got real quiet. All the initial distribution was done, so I sat around thinking… “I’m not famous, no one’s gonna call and no one’s’ gonna push my songs but me”. So, all the real work began at that point. Hawking radio, web stations, streaming live shows with cover songs and originals on social platforms. It’s a real job. The internet provided a platform for me and every other artist out there, so we all got access. So, this created a glut of artists and increased the challenge of finding your audience exponentially. But I’m doing this for “me”, not a record deal. I’m not rolling the dice to “make it big”, so that takes away from the stress of it, and allows me to maintain the joy of making music. But I’m still pursuing an audience. The fact that people from all over the world are listening to my songs is amazing! I just have to keep putting good songs out there that say something relatable… Maybe make someone’s day a little better… Then you start focusing on the next song. Other things get your attention… new songs start surfacing. Each song is not a conclusion, it’s always the beginning to another one. Is there a new, longer project on the way, and if so – what can we expect from that? I’m working on an EP, at the moment. More stuff from the 70’s and 90’s with a few new songs included… I’m experimenting with more textures and incorporating loops, like I did on Feel It Shine and More To Nothing from Adventures. I’m having a good time finding contrasting sounds and using them against different genre types to see if I can make something interesting. Do you perform with a full band, and will you be touring this year? I tour on the internet. LOL …. Now that I’m a legend in my own mind, I don’t need to tour. Seriously though; I’m building an audience online and on social platforms and that has been pretty satisfying. I’d gladly do it if a song got enough traction, but I’m happy with a virtual audience at the moment. I do all the instruments myself at this point. I would have to find players for hire… but the issue with that is finding people who will invest emotionally in your vision… In my experience it’s hard to find that for a one-off gig. What’s the songwriting process like for you, how do you get started – and how do you know when a song is truly finished? Hmmm…well… Other than picking up the guitar, starting a song is not really a conscious effort for me… The beginning is always a reaction to something I need to talk about. I react to events around me emotionally instead of intellectually. So, the “event words” affect me emotionally. I internalize them very quickly… So, my emotions inform my imagination before I have a chance to think about what I’m writing. The words kind of spill out. So it’s very reactive at first. I’ll write a whole paragraph or more of reactive phrases to what ever sets me off. Then go back and read through it more deliberately. Or sometimes words and chords and melody happen simultaneously… And I realise it’s something my subconscious has been working out… Most of the songs on the Adventures album were written like that. I’ll experience something and put it away because I don’t know how to respond to it. And later it usually surfaces in a song. More recently though, I was in film school at Academy Of Art University in San Francisco. I studied screenwriting there, and I think that really helped me form word pictures. That helped me experience words very differently than I did before going there. As far as knowing when a song is finished… Sometimes the catharsis or relief after writing a song is so clear, you know there’s nothing more to say… The song finishes it’s self. Other times the words I’m using aren’t working or the melody and chords aren’t supporting the lyric in a way that makes a clear statement. So, I have to take the time and sleep on it, let my brain work out the problem; John Cleese recently stated in a Ted Talk, when he was working with Python, that when ideas stopped coming for a sketch, he’d put it down and let his brain work it out overnight. And invariably it was much funnier the next day. Sometimes I’ll be three days into a song… I’m driving somewhere and I’ll hear a lyric or melody that makes me feel good…. When I get jazzed about it I know it’s a piece of the puzzle I was looking for. On the other hand, when I wrote Wish Upon A Starfish, that song happened in one night, literally in a couple of hours. So if you give it time… Don’t make a big deal out of it and let the process happen, a song will finish itself. That’s how it is with me, anyway. What are your plans creatively throughout 2019? If you could collaborate with anyone at all, past or present, who would you choose – and why? My Brother… He’s an excellent bass player and all these years have gone by and for one reason or another we’ve never recorded anything together. My wife as well, Tracy Colletto. She she’s an amazing singer songwriter. So, I’d like to do that before the last canary sings. Besides them, George Harrison and Tom Petty. They had a certain humility about them and I’ve learned a lot from listening to their songs. Geoff Lyn is another one … Down to earth but substantive, like Tom and George. Alison Krauss, is another. I don’t know that I would have anything to contribute to what any of these people communicate. I would try, if I had the chance. But I sure know I could learn from them. They’ve each tapped into something deeper that I would love to learn from. Other artists inspire dreams that lead us to inspiration, right? My left foot is bigger than my right, and I keep tripping over it. But I’m forgiven, so I have to get up every time and keep moving forward, or I’ll never reach that cookie jar. Find & follow Aaron Cabott Jones on Facebook & Twitter. Visit his Website for more information.